Vladimir Mayakovski. Mayakovski, Vladimir, photograph. The Literary Gazettte. Childhood in Bagdadi. 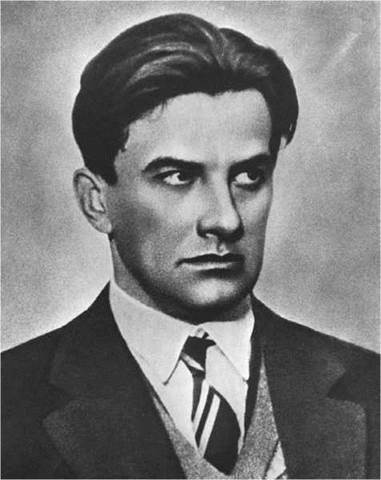 Vladimir Mayakovsky was born the youngest of three children on July 7, 1893, in the western Georgian village of Bagdadi to Russian parents—Vladimir Konstantinovich Mayakovsky and Aleksandra Alekseevna Maiakovskaia. His father was a forest ranger, an official of the Russian government whose work took him to the Caucasus Mountains. Young Mayakovsky would occasionally accompany him on these trips. He spent the rest of his childhood playing in and around Bagdadi, where he picked up Georgian, the only foreign language he ever mastered. The Social Democratic Worker’s Party and Prison. After the death of his father in 1906, Mayakovsky’s mother moved the family to Moscow. There he attended public secondary school. He was an intellectually precocious child who developed an early appreciation for literature, but he demonstrated little interest in schoolwork. In 1908 he joined the Social Democratic Worker’s Party, a subversive, anti-czarist organization. At this time, Russia was under the control of Nicholas II, the last czar in the country’s history. During his reign, peaceful protesters who aimed to present a petition to Nicholas II, were gunned down by the secret police in an event that ultimately undermined the power of the czarist regime, Bloody Sunday. Between the ages of fifteen and sixteen, Mayakovsky was arrested three times by undercover police who had amassed evidence linking him with such criminal activities as running an illegal printing press, bank robbery, and organizing a jailbreak of political prisoners. He was imprisoned for six months after his third arrest in connection with the jailbreak charge, and proved such an agitating presence among other inmates that he was frequently moved and eventually placed in solitary confinement. Release from Prison and Performing Poetry. Upon his release from prison, he entered the Moscow Institute of Art, hoping to become a painter. There he met the Russian Cubist painter David Burlyuk, who introduced him to the innovative trends in the visual arts and poetry known as avant-garde. Dressed in outrageous garb, such as the yellow tunic that became his trademark, the tall and ruggedly handsome Mayakovsky soon became the dominant and most popular poet-performer of the group, frequently captivating audiences with his loud, dramatic recitations. First Drama Written and Performed. In 1913, he wrote and performed in his first drama, the ‘‘tragedy’’ Vladimir Mayakovsky, which played to full houses of curious and sometimes heckling spectators. Two years later Mayakovsky met Osip and Lilya Brik, beginning a relationship that greatly affected his personal and professional life: Osip Brik, a wealthy lawyer with strong literary interests, became Mayakovsky’s publisher, and Lilya—Osip’s wife—became Mayakovsky’s mistress and the inspiration for most of his impassioned love poetry, including The Backbone Flute (1916) and About That (1923). Poet of the Revolution. The outbreak of the Bolshevik Revolution in 1917, which overthrew the czarist regime and gave power to the Soviets, provided Mayakovsky with an opportunity to combine his political commitment and artistic talents, and he plunged headlong into the cause of promoting the new regime. Victor Shklovsky, a leading Russian critic, wrote in his memoirs, ‘‘Mayakovsky entered the revolution as he would enter his own home.’’ Soon considered the official poet of the Revolution, he applied his poetic skill toward writing songs, slogans, and jingles expounding Bolshevik ideology, and also used his abilities as a painter and illustrator to produce a voluminous number of propaganda posters and cartoons. He was proud of his ability to create utilitarian literature without compromising himself as a poet, and critics also marvel at his achievement, often citing his three-thousand-line poem Vladimir Ilyich Lenin—written on the leader’s death in 1924—as one of his finest works, a communist equivalent of a religious epic. Soviet Representative. In the mid- to late 1920s, he traveled in Europe, Mexico, and the United States as an official representative of the Soviet government. On these trips abroad he kept a grueling schedule of public appearances and recorded his impressions of the capitalist societies he visited. He expressed his admiration of American technology and architecture in his America cycle (1925), which includes one of his most famous poems, ‘‘Brooklyn Bridge,’’ a eulogy to American engineering and the universal plight of the common laborer. Strained Relations. During the last few years of his life, Mayakovsky experienced a succession of personal disappointments and critical attacks from Soviet officials, all of which eroded his confidence and stamina. He had been growing increasingly disillusioned by the expanding party bureaucracy and the infiltration of bourgeois values into the new order. At the same time, conservative Bolshevik leaders charged that Mayakovsky’s writing was too individualistic. Joseph Stalin’s Five Year Plan advocated collectivization of agriculture and art alike; and the Bolshevik leaders claimed that Mayakovsky’s prerevolutionary Futurist beliefs were incompatible with their ideology. Under extreme political pressure, he was forced to abandon his editorship of New LEF, a revival of the Futurist magazine LEF, and joined the Russian Association of Proletarian Writers (RAPP), a conservative, state-controlled literary organization. Depression, Despair, and Suicide. The growing despair and ambivalence he felt toward his own life and the future of his nation is clearly reflected in his satires on the philistine Soviet bureaucrats—The Bedbug (1929) and The Bathhouse (1930)—written and performed in the last two years of his life. Considered outrageous offenses to the state, the plays received scathing reviews and were banned in the Soviet Union until 1955. Although in the last months of his life Mayakovsky maintained his usual hectic public schedule, he was emotionally devastated, taking the critical rejection of his work as a personal attack. Torn between the flamboyant originality of his art and a desire to ‘‘stamp on the throat’’ of his talent in service to the party, he played Russian roulette, a pastime he favored when despondent, and died by his own hand on April 14, 1930. Igor Stravinsky (1882-1971): Russian composer famous for his orchestral work for ballets, most notably Rite of Spring and The Firebird. David Burlyuk (1882-1967): Ukrainian artist closely associated with Russian Futurism who was an acquaintance of and early influence on Mayakovsky. Boris Pasternak (1890-1960): Nobel Prize-winning Russian novelist famous for his epic Doctor Zhivago. Joseph Stalin (1878-1953): Communist leader of the Soviet Union from 1922 until 1953, Stalin was infamous for his dictatorial rule and his ordered executions of perhaps millions of dissenters. Influences on Voice and Revolutionary Themes. Mayakovsky was strongly influenced by his love affair with Lilya Brik, his extensive travels, and by war and revolution. His lyrical verses are often about love. Yet, his political poems, which show other influences, cover a great range: He wrote a long, high-styled tribute to Lenin, funny political satire, and political pamphlets. He wrote children’s poems with political subtexts, occasional poems for events such as the building of a canal, and political poems meant to influence—not commemorate—political decisions. His love poems and even his advertisements showed political concern. About That (1923) is as much about politics as it is about love; one advertisement for rubber galoshes shows a hammer and sickle on the tread of a galosh. Voicing Historical Misfortunes and Controversies. As the so-called Poet of the Revolution, Mayakovsky voiced the misfortunes and controversies of twentieth-century Russian history. With his poems reading as exciting displays of verbal mastery, he strove to invent a voice that was truly revolutionary. Most notable is this voice of the poet persona, or speaker, he developed to issue forth his themes. In his politically oriented verse one role the persona takes on is that of a self-sacrificing savior who lays down his life for the Revolution. Another role the speaker frequently takes is that of a social critic and prophet of the Revolution. In A Cloud in Trousers (1915), for instance, this poet persona severely chastises the bourgeoisie (capitalist class) for their complacency regarding the impending destruction of their world. This speaker democratically equates himself with the ‘‘street thousands—students, prostitutes, contractors’’ in a manner reminiscent of Walt Whitman, whose poetry Mayakovsky had read in translation. The Futurist Style. The Futurist poets aimed to destroy traditional poetic modes. They did this through disregard for convention, use of bizarre imagery and invented vocabulary, and techniques borrowed from avant-garde painting, including irregular typefaces, offbeat illustrations, and the author’s handwriting. Mayakovsky virtually abandoned metric structure in his poetry. On the page his verse is arranged in irregular lines—often in a step formation such as that found in the work of the modern American poet William Carlos Williams—and is generally held together by strong, but unpredictable, internal rhyme schemes. Much of his originality as a poet is attributed to his use of hyperbolic (exaggerated) imagery, often blasphemous or violent. The Case of Comrade Tulayev (2004), a novel by Victor Serge. This book about the Stalinist purge is also a mystery, a thriller, and a tale of great courage and nobility. Darkness at Noon (1940), a novel by Arthur Koestler. In this story, the protagonist is a retired Bolshevik and revolutionary who is imprisoned, tortured, and tried for treason. In the Casa Azul: A Novel of Revolution and Betrayal (2003), a novel by Meaghan Delahunt. In this historically based novel, the author explores both revolution and love in the worlds of Frida Kahlo and Leon Trotsky. Man's Fate (1933), a novel by Andre Malraux. In this fictionalized account of the Chinese Revolution, the author explores the inner workings of the minds of such characters as Ch'en Ta Erh, a terrorist-assassin with a conscience. Whether Mayakovsky intended it or not, there were a few critical misconceptions about his work. To this day discussions about him still degenerate quickly to old pro- and anti-Communist positions that dominated the critical approaches to him and his work during the Cold War. Yet it is notable that a new image of the poet has begun to emerge, especially in scholarship published after the fall of the Soviet Union in 1991. That he excelled at studies in literature as early as the age of nine is also generally overlooked by critics, as they tend to interpret him as a populist illiterate. Further contributing to this critical misconception of the poet is the fact that Mayakovsky intentionally wrote as if he could not write. He disregarded academic verse structure. The dominant elements in his verse reveal a tendency for what is oral and a preference for emphasis on the sound of poetry. As Russian critic D. S. Mirsky describes it, ‘‘Mayakovsky’s poetry is very loud, very unrefined, and stands absolutely outside the distinction between ‘good’ and ‘bad’ taste.’’ It is marked by powerful rhythm, often evocative of an invigorating march cadence, which came naturally to Mayakovsky, who would loudly declare his verses in his booming velvety voice—by all accounts beautiful to hear. This dominant oral element managed to fool critics of Mayakovsky into treating him as a genuine illiterate, even though memoirs of him are full with accounts of his lying in bed reading or eagerly talking about something he had recently read. 1. Mayakovsky was the so-called Poet of the Revolution. Research the Russian Revolution of 1917. How did it affect Russian civilians? How is this impact reflected in the poet’s work? 2. Russian revolutionary Vladimir Ilyich Lenin had a profound influence on Mayakovsky, who even wrote a tribute song called a ‘‘paean’’ for his leader. Study a brief biography of Lenin. Then look up the definition and study the components of a paean. In group discussion, decide how important Lenin was to Mayakovsky. What in the paean Vladimir Ilyich Lenin suggests the poet’s attitude and feelings? 3. Those interested in the Russian Revolution should read Ten Days That Shook the World (1919), a firsthand account of the October Revolution of 1917 as experienced by American journalist John Reed. Lenin himself read the book and wrote a glowing introduction to the 1922 edition. Erlich, Victor. ‘‘The Dead Hand of the Future: The Predicament of Vladimir Mayakovsky.’’ Slavic Review, 21 (1962): 432-40. Urbaszewski, Laura Shear. ‘‘Canonizing the ‘Best, Most Talented’ Soviet Poet: Vladimir Mayakovsky and the Soviet Literary Celebration.’’ Modernism/Modernity, 9 (November 2002): 635-665. Linux.org. Vladimir Mayakovsky’s A Cloud in Trousers. Retrieved March 31, 2008, from http:// vmlinux.org/ilse/lit/mayako.htm. Loosavor. Meyerhold & Mayakovsky: Biomechanics & the Communist Utopia. Retrieved March 31, 2008, from http://loosavor.org/2006/08/biomechanics_social_engineerin.html. Last updated on August 5, 2006. State Museum of V. V. Mayakovsky. Retrieved March 31, 2008, from http://www.museum.ru/Majakovskiy/Expos1e.htm.